MERRY CHRISTMAS, CHAG SAMEACH, JOYFUL KWANZAA, BLESSED SOLSTICE and/or a DELIGHTFUL EID-AlUdha to all of you! "Wake up!" I said, shaking him urgently by the shoulder. He opened his eyes and smiled drowsily at me. "Move!" I said. "Jamie, you’ve got to move!" "I can’t," he said calmly. "I told ye that." He shut his eyes again. "Wake up," I said peremptorily. "Do you hear me? Wake up this moment! Move, damn you! Give me your hand." "I’m all right," he said. "But I’m gey tired, aye?" "Move your arms," I ordered, flinging the hand at him. "Flap them, up and down. Can you move your legs at all?" He sighed wearily, as though dragging himself out of a sticky bog, and muttered something under his breath in Gaelic, but very slowly he began to move his arms back and forth. With more prodding, he succeeded in flexing his ankles— though any further movement caused instant spasms in his back— and with great reluctance, began to waggle his feet. "Keep moving," I advised him. I got up with some difficulty, having grown quite stiff from crouching over him so long. "Move, I say!" I added sharply, as he showed symptoms of flagging. "Stop and I’ll step square on your back, I swear I will!" I glanced around, a little blearily. The snow was still falling, and it was difficult to see more than a few feet. We needed shelter— more than the rock alone could provide. "Hemlock," he said between his teeth. I glanced down at him, and he jerked his head toward a clump of trees nearby. "Take the hatchet. Big… branches. Six feet. C-cut four." He was breathing heavily, and there was a tinge of color visible in his face, despite the dim light. He’d stopped moving in spite of my threats, but his teeth were clenched because they were chattering— a sign I rejoiced to see. "Right," I said, taking my hand away and standing up with the hatchet. "Hemlock. Six-foot branches, do you mean?" Inside the silent grove, the fragrance of hemlock and cedar enfolded me at once in a mist of resins and turpenes, the odor cold and sharp, clean and invigorating. Many of the trees were enormous, with the lower branches well above my head, but there were smaller ones scattered here and there. I saw at once the virtues of this particular tree— no snow fell under them; the fanlike boughs caught the falling snow like umbrellas. I nestled down in the leaves between his body and the rock, wrapped my cloak around both of us, put my arms around his body, and held on hard. Then I found the leisure to shake a bit. Not from cold— not yet— but from a mixture of relief and fear. "It will be all right, Sassenach," he said. "With the two of us, it will be all right." "How long have you been out here?" I asked finally. "On the ground, I mean?" He started to shrug. Then stopped abruptly, groaning. "A good time. It was just past noon when I jumped off a wee crop of rock. It wasna more than a few feet high, but when I landed on one foot, my back went click! And next I knew, I was on my face in the dirt, feelin’ as though someone had stabbed me in the spine wi’ a dirk." It wasn’t warm in our snug, by any means; the damp from the leaves was seeping in and the rock at my back seemed to radiate coldness, like some sort of reverse furnace. Still, it was noticeably less cold than it was outside. I began shivering again, for purely physical reasons. Jamie felt me, and groped at his throat. "Can ye get my cloak unfastened, Sassenach? Put it over ye." It took some maneuvering, and the cost of a few muffled oaths from Jamie as he tried to shift his weight, but I got it loose at last, and spread it over the two of us. I reached down and laid a cautious hand on his back, gently rucking up his shirt to put my hand on cool, bare flesh. "Tell me where it hurts," I said. I hoped to hell he hadn’t slipped a disc; hideous thoughts of his being permanently crippled raced through my mind, along with pragmatic considerations of how I was to get him off the mountain, even if he wasn’t. Would I have to leave him here, and fetch food up to him daily until he recovered? "Right there," he said, with a hiss of indran breath. "Aye, that’s it. A wicked stab just there, and if I move, it runs straight down the back o’ my leg, like a red-hot wire." I felt very carefully, with both hands now, probing and pressing, urging him to try to lift one leg, right, now the other knee… no? "No," he assured me. "Dinna be worrit, though, Sassenach. It’s the same as before. It gets better." "Yes, you said it happened before. When was that?" He stirred briefly and settled pressing back against my palms with a small groan. "Och! Damn that hurts. At the prison." "Pain in the same place?" I could feel a hard knot in the muscle on his right side, just below the kidney, and a bunching in the erector spinae, the long muscles near the spine. From his description of the prior occurrence, I was fairly sure it was only severe muscle spasm. For which the proper prescription was warmth, rest, and anti-inflammatory medication. Couldn’t get much further away from those conditions, I thought with some grimness. "I suppose I could try acupuncture," I said, thinking aloud. "I’ve got Mr. Willoughby’s needles in my pouch, and—"
"Sassenach," he said, in measured tones. "I can stand fine bein’ hurt, cold, and hungry. I willna put up wi’ being stabbed in the back by my own wife. Can ye not offer a bit of sympathy and comfort instead?" I laughed, and slid an arm around him, pressing close against his back. I let my hand slide down and rest in delicate suggestion, well below his navel. "Er… what sort of comfort did you have in mind?" He hastily grasped my hand, to prevent further intrusions. "Might take your mind off the pain." I wiggled my fingers invitingly, and he tightened his grip. "I daresay," he said dryly. "Well, I’ll tell ye, Sassenach— once we’ve got home, and I’ve a warm bed to lie in and a hot supper in my belling, that notion might have a good bit of appeal. As it is, the thought of— for Christ’s sake, have ye ot the slightest idea how cold your hands are, woman?" I laid my cheek against his back and laughed. I could feel the quiver of his own mirth, though he couldn’t laugh aloud without hurting his back. At last we lay silent, listening to the whisper of falling snow. It was dark under the hemlock boughs, but my eyes were adapted enough to be able to see patches of the oddly glowing snow-light through the screen of needles overhead. Tiny flakes came through the open patches; I could see it in some places, as a thin cloud of white mist, and I could feel the cold tingle as it struck my face. Jamie himself was no more than a humped dark shape in front of me, though as my eyes became accustomed to the murk, I could see the paler stalk where his neck emerged between his shirt and his queued hair. The queue itself lay cool and smooth against my face; by turning my head only a bit, I could brush it with my lips. "What time do you think it is?" I asked. I had no idea, myself; I had left the house well after dark, and spent what seemed an eternity looking for him on the mountain. "Late," he said. "It will be a long time before the dawn, though," he added, answering my real question. "It’s just past the solstice, aye? It’s one of the longest nights of the year." "Oh, lovely." I said, in dismay. I wasn’t warm, by any means—I still couldn’t feel my toes—but I had stopped shivering. A dreadful lethargy was stealing over me, my muscles yielding to fatigue and cold. I had visions of the two of us freezing peacefully together, curled up like hedgehogs in the leaves. They did say it was a comfortable death, but that didn’t make the prospect any more appealing. Jamie’s breathing was getting slower and deeper. "Don’t go to sleep!" I said urgently, poking him in the armpit. "Agh!" He pressed his arm tight to his side, recoiling. "Why not?" "We mustn’t sleep; we’ll freeze to death." "No, we won’t," he said crossly. "It’s snowing outside; we’ll be covered over soon." "I know that," I said, rather cross in my turn. "What’s that got to do with it?" He tried to turn his head to look at me, but couldn’t, quite. "Snow’s cold if ye touch it," he explained, striving for patience, "but it keeps the cold out, aye? Like a blanket. It’s a great deal warmer in a house that’s covered wi’ snow than one that’s standing clean in the wind. How d’ye think bears manage? They sleep in the winter, and they dinna freeze." "They have layers of fat," I protested. "I thought that kept them warm." "Ha ha," he said, and reaching back with some effort, grabbed me firmly by the bottom. "Well, then, ye needna worry a bit, he?" With great deliberation I pulled down his collar, stretched my head up, and licked the back of his neck, in a lingering swipe from nape to hairline. "Aaah!" He shuddered violently, making a sprinkle of snow fall from the branches above us. He let go of my bottom to scrub at the back of his neck. "That was a terrible thing to do!" he said, reproachful. "And me lyin’ here helpless as a log!" "Bah, humbug," I said. I nestled closer, feeling somewhat reassured. "You’re sure we aren’t going to freeze to death, then?" "No," he said. "But I shouldna think it likely." "Hm," I said, feeling somewhat less reassured. "Well, perhaps we’d better stay awake for a bit, then, just in case?" "I wilna wave my arms about anymore," he said definitely. "There’s no room. And if ye stick your icy wee paws in my breeks, I swear I’ll throttle ye, bad back or no." "All right, all right," I said. "What if I tell you a story, instead?" "And the specter said, ‘I am the Ghost of Christmas Past…’"
"…and there was dear old Fezziwig, among the lights and music…"
"’God bless us, every one,’" I ended, and lay silent, a small needle of grief like an ice splinter through my heart. It was quiet inside the shelter, and seemed darker; snow had covered over all the openings. "Put your hands inside my shirt, Sassenach," he said softly. I slid one hand up under his shirt in front, to rest against his chest, the other up his back. The faded whip marks felt like threads under his skin. "Sleep, a nighean donn,"" he said. "I wilna let ye freeze." Click here to read excerpts (aka "Daily Lines") from Book Nine, the new book I am working on in the OUTLANDER series. Also posted on my Facebook Page on Friday, December 25, 2015. 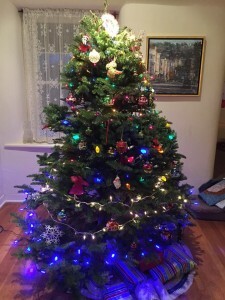 The image is of my family Christmas tree for this year. Happy holidays to you and yours and thank you for the excerpt. This was one of my favorite scenes in Drums of Autumn and it’s so appropriate to the season. Thank you all the Outlander stories, they are among my favorites. Thank you Diana for this excerpt. I love this part of the story in Drums of Autumn. I only discovered your books in May of this year . I cannot believe I have never found then before! There is no adequate way to describe their effect upon me. Whilst reading them no chores were completed, my husband was regularly unfed and time passed without me noticing !! I have read all eight books now and look forward with great anticipation for number nine. Claire and Jamie are vivid in my mind and their story , the story of their marriage , is realistic and recognisable. Extraordinary books with much to tell us about our relationships with others. My interest in American history has also been established- my long suffering husband has spent hours finding reference books for me. He has also started reading – from Washington- biographies of all US presidents!! Oh- and my!! How you tell a story! I was hooked by the second page of ‘Cross Stitch’!! (I have read all of the Lord John novels too). The TVs production is breathtaking too. Thank you Diana, for the joy and exhilaration your books bring. I´m so glad to know there are other readers who have become as captivated by Diana´s books. I gave Volume one to several of my friends for Christmas, but none have become as obsessed with them as I was. I think her way of seeing and describing human relationships and her thoughtful explorations of moral and philosophical questions (while remaining humorous ) are deeply moving. Perfect choice! Love, peace , comfort. Thank you! My birthday is Dec 25th and this year we celebrated by watching the first season on Outlander. For New Years Day we are going to watch the second season. Thank you for making Jamie and Claire’s story such an entertaining and life changing saga. I read your first book years ago and have loved all of them since. The Starz series has added to that enjoyment and I am grateful to be able to see it. Merry Christmas to you and blessings. oh this was good, like beautiful, old Christmas ornaments on cedar limbs. Happy Holidays to you and yours! And, thanks so much, for being so free to share and communicate with your readers. I wonder at how you must feel to know that your work has brought so much entertainment, joy, sorrow, comfort (a whole gamut of emotions, really)! Your Frasers have become beloved characters for all of us for many, many years. Your series of books can be re-read numerous times and I always find something that I missed — and things that affect me differently over the decades, depending on where I’m at or what’s going on in my life. The Starz show is amazing – - but, I’ll always want to go back to the comfort of your books. Thanks, again – - your talent is a blessing to so many of us! Diana , loving the tenderness of these dialogues ..interspersed with the Scottish dry humour, and Claire’s intelligent banter. I lived in Gilbert, Arizona for many years. During that time so many of my friends kept encouraging me to read your books, knowing I was a truly fanatic,crazy, and patriotic Scotswoman! I only just started reading your novels and have watched Outlander here in Scotland ..and I am soo hooked! I’m sorry I missed your book signings, missing watching some of the filming in nearby Falkland and Dysart…but I am resolved to embrace all things Outlander from now on. I have my hubbie, and two sons avidly watching the first series now..and the passion and tenderness of your books has meant a lot to us a couple, as I recover from mastectomy. So dear lady, haste he back to the land of the roaming haggis, and share a cup of Earl Grey Tea with us, or perhaps a wee Glayva? Thank you! What a lovely way to end the year or begin a new year! Wonderfully peaceful. I only recently discovered this website and am now a faithful reader. My daughter gave me Volume One in German, as “Feuer und Stein”, in May 2015, whereupon I read the first two pages and was instantly addicted. I read all eight books between May (Volume One–as “Crossstitch”I read a second time in English as soon as I finished it in German-I think the translation is nowhere as good as the original- and all the rest in English) and July and after finishing the last pages felt so desolated and having to leve the company of the wonderful characters that I started again with Volume one, now in the “Outlander” edition. This has continued; At the moment I am into the fifth re-read, presently on page 265 of “Drums of Autumn”. I´m so addicted to your wonderful storytelling genius that I have also finished 3 of the Lord John books and most of the first volume of “The Outlandish Companion”, seen all the TV Series, and am now planning a short visit to the highlands in June. My daughter just gave me the two volumes of the “Companion” for Christmas and the DVD´s of the series, plunging me into a new frenzy of happiness. I am a avid and rapid reader and have read thousands of books in my long lifetime, got my BA at Cornell in English Literature, went to Boston University for an MA in English and American Literature, went to Harvard to get a PhD but was diverted into Learning Psychology, worked as an English teacher in a Boston High School but emigrated to Germany over 50 years ago. My great loves in literature were Gerald Manley Hopkins, Shakespeare and Dickens, but Dickens is the only other author who entranced me so much that I almost cried when I finished one of his stories -I read “David Copperfield” twice in a row because I simply couldn´t let the book be over with. Diana, I think your language, your storytelling, and the issues you deal with in your stories are breathtaking and I have only one regret–that I couldn´t read these books as a young woman. I think they might have changed my life. But now they have changed my old age and I am very grateful to you. Ditto everything Fean Shaw said except I have yet to read the Lord John series of books – will be searching for those now. Thank you, great stories. Happy new year. Thank you for many hours of reading pleasure, for writing what is in your heart and for sharing a beautiful love story. I have read the books many times and truly feel it is the best work and most inspiring work I have ever read. I am waiting patiently for your latest book. You have shared so much to so many people and you and these books must be an inspiration to everyone who reads and watches your work. The impact of helping the Scottish people and bringing history to a new generation is a gift that will last forever. I do hope Caitriona and Sam get married soon. They have so much to offer each other, in life and in the series. What a shame to waste a day apart. They are both so caring and thoughtful in life and in the series. I do not know for what they are waiting. You, your family, Ron, his wife, Merrell, Tobias and all of the cast and crew have given a great gift to society. Enjoy your family and inspire your children to write. I wish the best for you and your family, good health and happiness for a truly good year. Thank you. It is uncanny how your books reach people deeply into their hearts and souls no matter what their life’s journey was or is. I live in each book as many times as I re-read them. (I still know who “I” am though… Drat!!) Thx for the excerpt. Heaven’s Blessings to you. Just about read Voyager again, its the only Outlander book left on my bookshelf, as I anxiously wait for my friends to read and return all the other books..I must say I feel a bit bereft looking at the bare shelf..but the thought of the enjoyment and the conversation and comments when they are returned is my reward.. I was recommended the books by an acquaintance at the beginning of last summer I’ve never read a historical novel before, but based on her enthusiastic description I went into the nearest bookshop and bought the first two books. By the end of the summer I had read all eight. As i finished each one i passed them on to my sister who does love historical novels. she became as hooked as I was and although she was four books behind me, we were having late night text conversations about Jamie and Claire (but mostly Jamie!) and the net has spread as we both have several friends now reading them too. My sister started watching the series on Amazon prime, which i staunchly refused to do, as I read in pictures and had a very fixed image of Jamie in my imagination and I didn’t want that to change. However my sister came to stay a couple of weeks ago and brought the DVD set with her and i caved! WOW! She was right the series didn’t detract one bit from the books (which often is the case). I did after a few days complain that I had lost “my Jamie”, but I’ll take Sam as a perfect replacement any day! I have given the first two books as gifts to a few friends, with a note saying these are so much more than books – “I give you the gift of Jamie Fraser”! thank you, I’m looking forward to book nine. Glad you’ve been enjoying both books and show! While a TV show can’t ever capture _all_ the details and scope of a big book, it can certainly add a wonderful complementary visual aspect! With reference to Drums of Autumn. You mentioned that Galloway Cattle were being loaded onto the ship. (I learned a little bit about the white belted Galloway being a rare breed on a farm in California, so it struck a note with me.) Today while looking up a local farm, a breed of cown was mentioned so I figured I would look it up so that I can tell the difference between the standard brown and white cow and the black and white cow, etc. for my grandchildren. I then looked up the Galloway. It mentions that the Galloway originated in Scotland in the 1700s but it was not exported to Canada until the mid 1800s and the US in the later 1800s. So I question the correctness of Galloway cattle being loaded onto a ship headed for the colonies in the 3rd quarter of the 1700s. Thank you for your books. They have been so much fun and I spend a lot of time looking up history. History is not necessarily what happened; it’s what people chose to write down. [g] Can you state with complete confidence that it’s impossible than anyone ever sent Galloway cattle to the American Colonies in the late 1700′s? Granted, it wasn’t common, and you don’t see reports of such shipping on commercial manifests prior to the mid-1800′s–but the breed existed in the 1700′s, ships existed in the 1700′s–and the American Colonies certainly existed in the 1700′s. [g] Ergo, it was physically possible. If some mad entrepreneur decided to risk it…who’s to say he didn’t? Certainly every action ever undertaken by anyone wasn’t written down; at best, history is a small sprinkling of (often) randomly collected records, never a complete and faithful picture of the past.